subspecies of cutthroat trout, there is no other fish like it anywhere in the world, and TU is working to restore it throughout its native range. 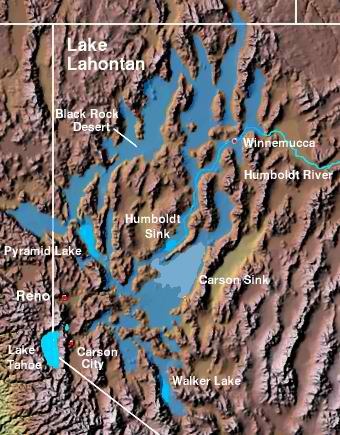 The Lahontan cutthroat occupied the Great Basin during huge fluctuations in lake levels and the eventual creation and disappearance of Lake Lahontan. This occurred over a period of some 75,000 years (Lake Lahontan dried up about 9,000 years ago). Through these dramatic swings between wet and dry periods, this highly adaptive native species has persisted, and now occupies stream and terminal lake systems throughout northern Nevada. Evolving to thrive in the harsh habitat of the Great Basin has made the LCT highly distinct from other cutthroat trout. This species also has a great variety of forms across its range, making it one of the most interesting of our native trout – and a prized target for anglers. The Lahontan cutthroat’s historic range spanned several degrees of latitude, from the meandering meadows of the Lake Tahoe basin to the rugged, remote high-desert streams of the Jarbidge or Toiyabe mountains. Prior the mid-19th century, the Lahontan attained epic size and weight in Pyramid and Walker Lakes (the world-record for cutthroat trout is a 41 pound LCT from Pyramid Lake), leading contemporary writers to call it the “salmon trout.” Today much of the Lahontan’s habitat diversity has been lost, and the species is at a pivotal point – it is now listed as Threatened under the Endangered Species Act. Trout Unlimited is in a unique position to help turn this species around and to bring back some of the “nowhere else in the world” fishing opportunities associated with this trout. Our partners at the National Fish and Wildlife Foundation (NFWF) recently made Lahontan cutthroat trout the focus of one of their Keystone Initiatives, which will provide significant matching funds for restoration and conservation activities for years. Consequently, every dollar that TU invests in LCT restoration will be leveraged by state, federal and private dollars available through the Keystone Initiative. Reconnect fragmented habitat through partnerships with ranchers, mining companies, and other stakeholders to create metapopulations and strongholds and upgrade infrastructure (old culverts). Restore degraded habitat to improve water supply reliability and ecological function. Sustain conservation progress by guiding and coordinating the NFWF Keystone Initiative, reinvigorating current and establishing new chapters, managing non-native species to reduce impacts on LCTs, maintaining robust lake populations, and increasing angling opportunities across the range. In the past 3 years TU has significantly boosted our capacity in the campaign to bring back the Lahontan cutthroat across its historic range, with new Science and Watersheds staff and seasonal field crews at TU dedicated to this effort as well as new resources with our agency and Foundation partners. On the ground, we have established a Conservation Ranching program that has already produced partnerships with ranchers to restore habitat and stream connectivity on their lands, resulting in migration of LCT into places they have not occupied for decades. We have helped reintroduce LCT to many watersheds in the Sierra Nevada and eastern Nevada. And we have reached agreement with federal/state agencies and agricultural, mining, forestry, and recreational users to partner with us in restoring habitat degraded by both human and natural influences.